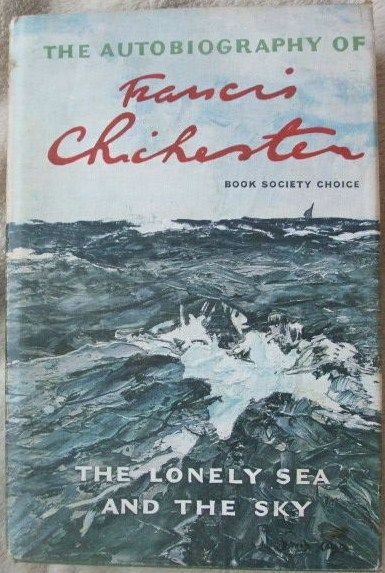 First edition, fourth impression hardback of THE LONELY SEA AND THE SKY, by Francis Chichester and published by Hodder & Stoughton Ltd., London in 1967. The book is in very good condition (green cloth boards and gold lettering with black background on spine which has slight fading and creasing to spine edges and rubbing to a couple of corners and light liquid stain on spine) with slight wear to the illustrated paper dust jacket, which is price clipped (some rubbing to corners and spine edges, and slight tanning and a liquid stain on the spine which is also inside the jacket, slight fading to top page ends). Internally, the pages are clean and tight. There is a previous owner's 'Ex Libris' bookplate attached to the front endpaper. Sir Francis Charles Chichester KBE (17 September 1901 – 26 August 1972), aviator and sailor, was knighted by Queen Elizabeth II for becoming the first person to sail single-handed around the world by the clipper route, and the fastest circumnavigator, in nine months and one day overall. After serving in World War II as an air-navigation expert in England, he founded a map-publishing business in London. He took up ocean sailing in 1953 and won the first solo transatlantic race in 1960 in the 'Gipsy Moth III,' sailing from Plymouth to New York City in 40 days. He was knighted in May 1967 by Queen Elizabeth II. His last solo voyage in January–February 1971, from Portuguese Guinea to Nicaragua, covered 4,000 miles in 22 days. He died shortly after illness in 1972 prevented him from making the solo transatlantic race. His books include the autobiography The Lonely Sea and the Sky (1964) and The Gipsy Moth Circles the World (1967). "The lone adventurer extraordinary is Francis Chichester. Extraordinary because of the time-spread and diversity of his adventures. He not only made the world's first solo long-distance seaplane flight in 1931, but also won the first solo sailing race across the Atlantic in 1960. The first was probably the toughest flight ever made and the second the toughest race ever sailed. Here is a navigator in the true Elizabethan sense. In 1932 he received the top award for air navigation and in 1961 the top award for single-handed navigation. Not content with his 1960 trans-Atlantic record he raced his own time across to New York in 1962 aged 60 and reduced his previous record by seven days. One of the most moving parts of the book tells how his wife, to whom he had been married to for 20 years, saved his life when lung cancer had almost killed him: and how her faith in him was justified so that she was able to sail back across the Atlantic with him only three years later. This is one of those priceless true stories in which drama and excitement flow effortlessly. It will surely rank as one of the great life stories of the twentieth century." 352 pages. Illustrated with numerous black & white photographs and maps.